Robert Hall Lewis Interview with Bruce Duffie . . . . . . . . .
includes works unmatched in refinement, sophistication, richness of texture and inventiveness. The eminent composer Robert Hall Lewis died last Friday, just before his 70th birthday and barely a year into his retirement from Goucher College and the Peabody Institute. He is survived by his wife, Barbara, and his daughter, Renata. He is survived as well by his beautiful music: more than 70 orchestral works, including four symphonies and innumerable chamber works. 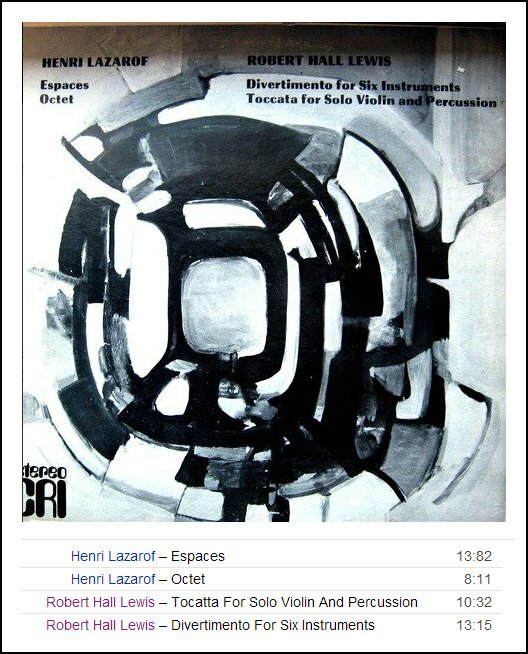 Especially noteworthy among the latter are four string quartets, the last two of which are intense, highly concentrated examples of some of the best work in that medium done in our time. But Bob, as he was known to friends and colleagues alike, was a lot more than a fine composer, although that fact alone would ensure a high place in the music-world's regard. He was also supportive of the cause of new music in the greater Baltimore musical community. 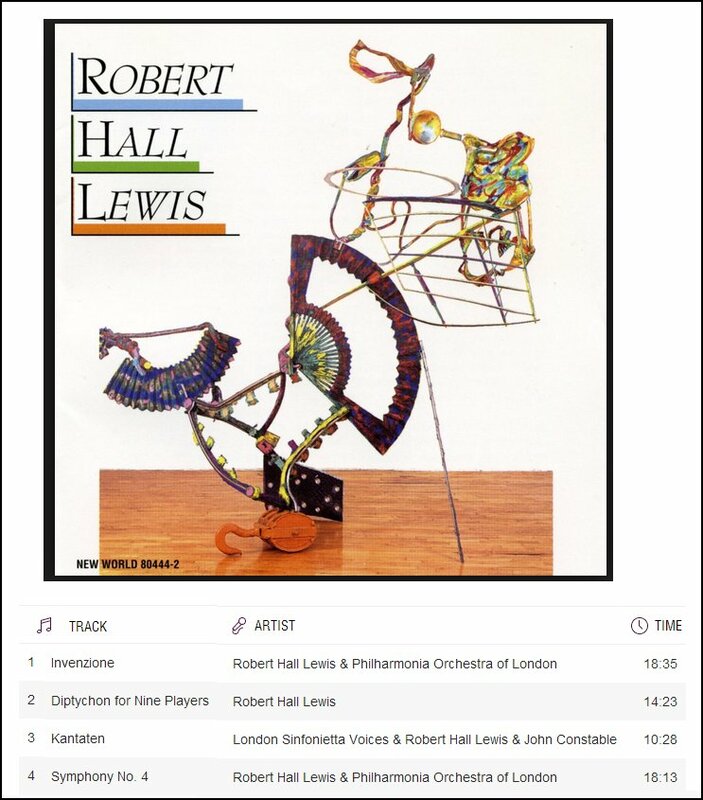 Bob was an excellent conductor, and not only of his own music, in which he led assorted London ensembles for two compact digital discs of his works, but of difficult works by other contemporary composers as well. Bob was an exemplary teacher, as his students would attest. He held his charges to the strictest standards -- standards to which he held himself most of all. His vast knowledge and experience of orchestration alone served his students well; many have achieved prominence in the musical world. One of Bob's many values to the musical community was as a "gadfly." One might describe him as the "town scold." He deplored mediocrity and compromised standards, and he railed eternally against the temporizing repertory choices of performing and presenting institutions. 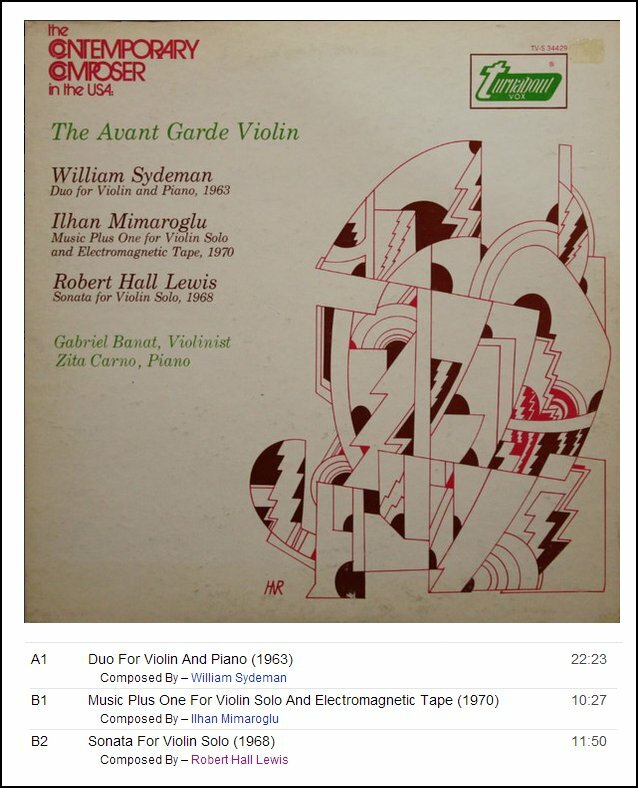 Still, he was successful in gaining performances of his music in several notable venues, including the Baltimore Symphony Orchestra and the American Composers Orchestra. For many years, Bob was the music director of the Chamber Music Society of Baltimore, a presenter of chamber music with emphasis on the living composer. The distinction of the society's programs owes everything to Bob's stewardship, and it will be a hard task to find someone to fill his now empty shoes. It will be difficult as well to find another "gadfly," and especially one whose criticism was tempered with an abiding love of music and extreme goodwill toward his colleagues and students whose efforts he so generously supported. 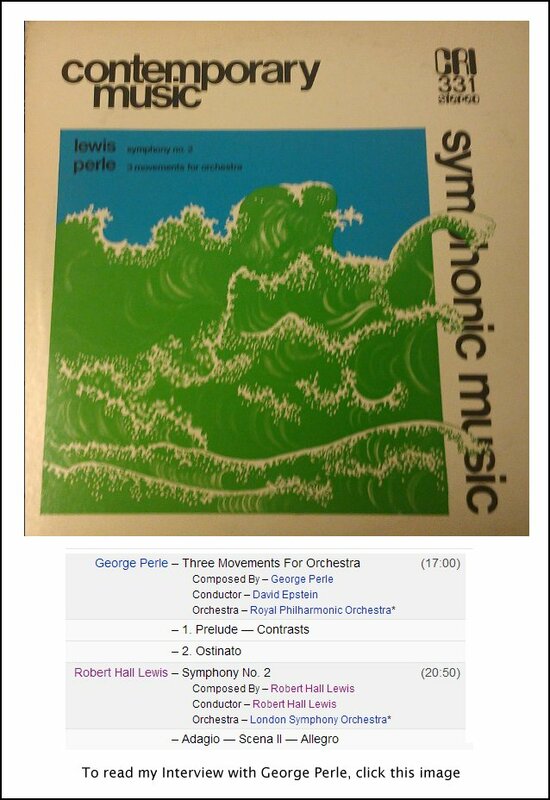 It is as a composer, however, that Bob Lewis is simply irreplaceable. There is no other music like his -- in refinement, sophistication, richness of texture and inventiveness. The over-riding description is "beautiful," and beyond that, words are wanting. If it were not for the over-production of composers today, if it were not for the vast publicity machines garnered by them for self-promotion, if it were not that performing institutions by and large refuse to take risks in their selection of new music, if it were not that the music industry in this country is geared to the promotion of "stars," then Bob would be recognized for the great composer that he was. But Bob was too busy creating music to bother himself with these things. When he was not writing music, he was supporting that of others. For all these things he will be sorely missed -- by his family, his friends, his colleagues and his students. The musical community -- and the music world -- has lost a true friend. Portions of the interview were used (along with recorded examples) a couple of times on WNIB, Classical 97 in Chicago, and now I am pleased to present the entire chat on this webpage. When I spoke with Lewis, in some ways he was a contrarian, and said so himself. His answers to my questions showed a deep understanding of the situation, and he never soft-pedaled his ideas or reactions. Here is what was said that afternoon . . . . . . . . .
Bruce Duffie: We were talking about the euphoria of the premiere that sometimes, and sometimes not, translates into future performances. Have you generally been pleased with the first performances of your works? Robert Hall Lewis: In general, yes. Naturally there are the disappointing periods when perhaps the reception is not as desirable as you would hope, and that the performance — or the participation of the musicians — may not be as enthusiastic as one would hope for. I would say I have about eighty per cent positive record on that. The other twenty per cent would have to be listed in the category of mildly disappointing. It depends upon who is calling the shots. If you have a great orchestra and a great conductor, this is probably going to be a very successful event — assuming that the piece is good. It’s an assumption that you cannot always make because many times one will hear a piece — at least a composer in judging another composer’s work — and consider it not to be such a fine work. BD: But is it correct to assume that a lesser orchestra, and perhaps a lesser conductor, does not mean it will be necessarily a poor performance? RHL: Oh, no. Many times a less than totally stellar orchestra can put together the resources and the energy to bring off a work very well. It all depends upon the difficulty of the work, the style, and the time that’s been allocated to prepare the work. BD: Do you take this into account when you’re writing the work? RHL: As a general rule, but I don’t seem to be able to adjust my style to a great diversity of performing talent. I always shoot very high in a rather idealistic fashion for what I consider to be the top level of professionalism. I’m essentially uncompromising when it comes to this. I’ve been fortunate in being able to write compositions for fine ensembles, whether they be orchestras or soloist, chamber groups, or choruses. Obviously there are some situations, as far as the performing resources are concerned, but I don’t compromise because in general I know whom I’m writing for and they are good musicians, and I compose accordingly. BD: Do you ever take into account your audience when you’re writing a piece? RHL: There are many kinds of audiences, as you well know. There are people who may congregate who may have never heard music before in their lives. There are all kinds of unique assemblages of human beings who get together. BD: Is there really going to be someone on the face of the earth who’s never heard any kind of music at all? 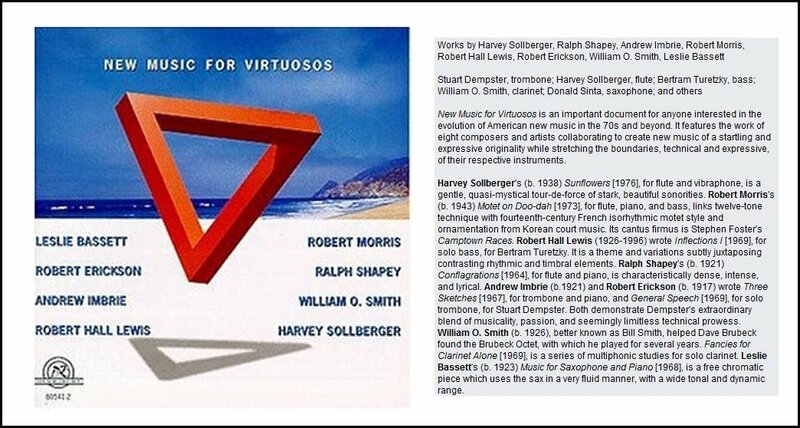 RHL: [Smiles] Well, let me clarify that to say ‘serious classical music’. In general, one can assume to have an audience as being reasonably sophisticated, and having had some exposure to the literature of the present time, and perhaps even some knowledge of music history of the twentieth century. This, of course, can be erroneous because the knowledge of the history of twentieth century music is a pretty rare and esoteric area, and not too many people know anything about it. But I should write for an audience that hopefully has heard some of my predecessors — such as Stravinsky, Bartók, Schoenberg, Webern, Berg, etc. — and thus what I write is somewhat in the continuation of that tradition. What I try to do is give the audience the best possible work I can, with a great deal of variety of mood and of character at times. But fundamentally I try to give them what I consider to be the highest work I can produce, so in that regard I am thinking of the audience, yes. But I’m not thinking about the audience in the sense that I’m trying to entertain them, or titillate them, or do something which I consider beneath my dignity as an artist. BD: Is there any place at all for entertainment value in an artistic achievement? RHL: Of course, but it depends if you’re talking about the popular entertainment, or whether it’s a kind of intellectual entertainment, which can yield certain delights to the mind, and also convey a certain emotional weight and variety. I’m not speaking now about pop culture and that kind of entertainment value, which I find rather anathema when it comes to my own work. Yes, there can be moments of entertainment in the sense that you can produce certain effect in an orchestra, or in a chorus, or even in a chamber group, which may yield a certain amount of humor, or some aspect which may mildly titillate an audience. But as far as trying to bring the house down in any sense of that kind of entertainment, no, that is not my ‘métier’. BD: We’re kind of dancing around it, so let me ask you the question directly. What is the purpose of concert music in today’s society? RHL: In the highest order of thinking, the concert world is fundamentally to elevate the consciousness of the human being. One tries to inspire, to perhaps instill certain creative and artistic values. It is also a reasonable function to give a certain amount of pleasure, and to create, hopefully, a mood of receptivity and perhaps even in some cases joy, and then immense satisfaction. If you’re speaking about many twentieth century composers, I don’t know that we can say that is something which everybody is able to do. But the idea is that, on leaving a concert, one should be a person with their sights, their consciousness, and their minds stimulated, and to that degree they are a better person for having gone to that concert. BD: Your pieces are performed on concerts of twentieth century music, and also on mixed concerts where there’s old music and new music. Do you have a preference, one over the other? RHL: It depends. Many times when you’re performed by a group that is playing purely twentieth century music, the group is more skilled in that medium, and therefore there may be the distinct possibility of getting a better performance because you’re being performed by this group that is skilled and specializes in that particular phase. Sometimes when you’re played by a group which is playing mixed repertoire, there may be a certain lack of affinity, or a lack of technical preparation for the more specialized twentieth century pieces, especially if it’s difficult and challenging in the rhythmic and textural sense. In that regard, perhaps the performance may not be quite as effective as it would be if it were played by a group that was playing exclusively twentieth century music. BD: You do quite a bit of conducting of your own music. Are you the ideal conductor of your pieces? RHL: In general, I would say so. I certainly would know the tempi, and the general character, and certainly the melodic and harmonic strands — the things that have to be emphasized — better than most people, although I’ve had some conductors who at times may have done things better than I could do them. It’s very difficult for me to say. In general, the composer is the definitive voice for his own work. Naturally it also depends if the composer can conduct. You cannot assume because a composer gets up and conducts that he’s going to be a good conductor. There is a great deal of technical background which goes into conducting, and the technical development — the skill, the precision, the gestures, the aural development — are things which don’t come in ten easy lessons. But to get back to your basic point, fundamentally I would feel that I would be very close to giving about as good a performance of my work as anyone. BD: Do you write into your music places for interpretation, or do you want it always to sound exactly the same? RHL: No, no. In this respect I would have to be rather liberal in granting performers a certain amount of liberty in doing things their own way if I’m not around, or if I have no say in this. There are areas in music which can be interpreted in different ways, and this I like. I’m very flexible when it comes to allowing certain liberties and elements of freedom in my own work, as long as it does not destroy the basic sense of form and continuity of rhythm, and the association of ideas, etc. BD: So you don’t want things to be destroyed. Do you want things enhanced? RHL: Fundamentally, one is always hoping for some kind of enhancement. This again is one of the things that you hope for. The polished performers will obviously give you an enhancement. Sometimes the lesser people will try, but there may be areas whereby there are certain shortcomings, or lack of a conceptual grasp which you’re doing, and the enhancement may be not there at all. In fact, it may be a diminution of quality rather than an enhancement of quality. BD: Are most of your works on commission? RHL: That varies. Sometimes I do them on commission, other times I do them just because I want to do them, or I have a publisher who I know will take a work, but I’m not getting much money for it. BD: When you get a commission how do you decide if you’ll accept it or perhaps turn it aside? RHL: Commissioning is very variable thing in this country. Commissions can range from a hundred dollars — which sounds distressing, I’ll admit — but there are small commissions, and there are large commissions. Fundamentally you accept the commission on the grounds that it is something that you want to write very seriously. You feel that there are various values. There’s a niche in the literature that you can fill by writing this composition. If you feel that the performers may give it repeated hearings, and if the positive factors of the composition seem to emerge more strongly than the negative, then you might be willing to take it if it is a lower paying commission. I don’t turn down very many because, frankly, I have not been overwhelmed with commissioning. The most I ever had at one time was seven, and I must say I felt there was quite intense pressure. I had to get all those out within a two or three-year period, and it’s difficult when you have to teach at two institutions, as I do, and do a certain amount of promotion of your own work, and operate the general activities of life, as we all do. If you have this deadline pressure on you, not only must you get the music finished, but you must get it copied and then sent out so people can rehearse it. All this presents a certain stress. Some people do this better than others. I’m able to handle it to a moderate degree, but I would not be want to be overwhelmed by a back-up of some twenty commissions, which I have heard some people have. It’s very nice if they can handle it, but I can’t. BD: It’s nice that you do know what you can handle, and you can handle what you have accepted. RHL: I try and keep a control over this, yes, but it’s not always easy. Recently I was trying to complete an orchestral work for National Endowment for the Arts. It’s based on paintings of the Dutch painter Hieronymus Bosch, and I must say that some of the textures I created were so intricate and so involved that my hand went far beyond what we call the usual writer’s cramp. It developed what seemed to be a kind of tennis elbow. Don’t ask me how that developed or occurred, but my arm was so sore that I could not copy anymore for fear of what was happening. I was wondering if it wasn’t beginning to paralyze my arm, so I simply gave up the whole thing. At the moment it’s still unfinished because of that difficulty. So there’s another one of the great dangers that can happen if you overwork. I use a very fine pencil made by King brand people in New York, and that involves a very intense pressure on the arm and hand in getting a very legible and black copy. It’s that sustained pressure for hours or days on end that can often cause this muscular difficulty. BD: But it happened in that piece, and not, say, in a more simple string quartet? RHL: That’s correct, yes. The greater the musical involvement and complexity, the more dangerous possibility of some cramp. But this was a fluke. I don’t want to say that this is something that happens to everybody. It never happened to me before like this, but I was really so involved with trying to get the most perfect-looking example I could. It was a question of alignment, and getting multitudinous notes in the right place for several instruments, and so on. It becomes a kind of nervous quirk, and can really become internalized rather perversely, I must say. BD: When you’re putting the ideas down on the paper, do you always control that pencil, or are there times when that pencil seems to be controlling your hand? RHL: You mean the actual composing itself? 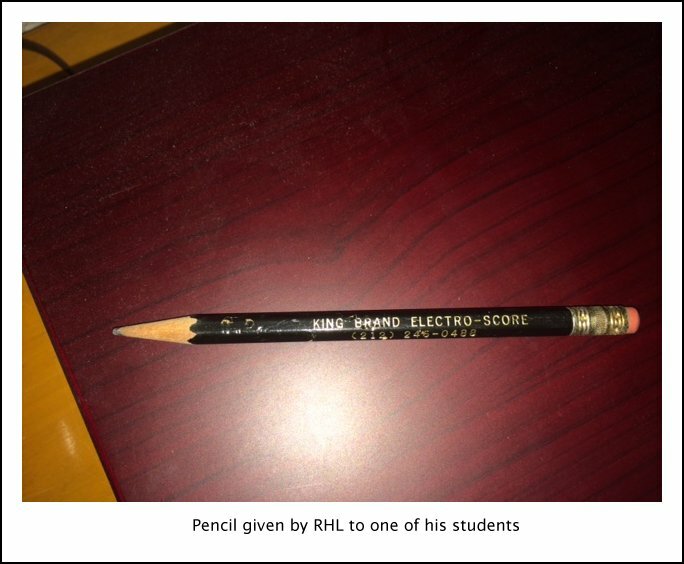 RHL: The pencil is, after all, the executive. The ideas come from the mind and the ear. BD: Are there times when you’re surprised at what actually comes out on the paper — that you’re not completely in control of where it’s going? RHL: No, I would not say that. I am very much in control of where it’s going, and if my musical impulse directs the pencil in the direction for a certain gesture, that is certainly a conscious response. I know exactly what is there, so it’s not as though there’s anything accidental going to happen with my pencil. BD: You brought up the fact that you’re teaching at two different institutions as well as composing. Do you get enough time to compose? RHL: I’d have to say, yes. I have arranged the schedule whereby I’m free in the mornings. I can work about three hours a day. During the academic year that would seem to be enough. I can work evenings too, so you might add another two hours to that. I find it difficult to sustain composing more than about six hours a day, unless it is an extreme emergency or a deadline. Then, of course, you can go on longer, but I don’t have any great complaints about that. It is the extraneous factors in life which peeve... such as having to go down and fight the tax-assessment board about the sharp increase in your property taxes; or having to go over and have your automobile tested to see if it is kicking up too much exhaust. [sighs] All the various bureaucratic details that seem to have impinged upon life these days are the things that I find frustrating. The mistakes that are made by computers; things that come in that have to be corrected; telephones that don’t answer, and all that kind of humdrum that seems to be part of our contemporary life. These are the things that I find most draining, but as far as the actual time to compose, no. I am reasonably well-off on that score. BD: Is life getting too complicated to live? RHL: No, of course not. We all have to adapt to these things, but I find that many creative people — some of whom are more irritated by these problems — just let them slide until they get themselves in a kind of jam because of it all. I try to keep going on a very efficient schedule, but if one has a home to maintain, and a family, one has to pay the bills. There are various things involved in simply day-to-day existence which many creative people find quite irritating. BD: And yet some of these are people who attend your concerts, and will have been doing these kinds of business things all day, every day, just as you have. RHL: Well, yes. [Laughs] Most people work — though some people are fortunate enough not to have to — but they bring all these things to the concert hall, perhaps, but to a controllable degree. I’m not saying that my affairs are out of control. I’m simply saying that their effect on me as a creative artist can be debilitating and be very aggravating, and can block the speed of progress of my work, whereas someone else who does not have those creative demands nor the creative pressures, will not be affected adversely at all. Obviously life is not getting any easier for most of us, and if life were easier and some of the stress factors were lower, you would find more people enjoying more music, especially in the concert hall at night. BD: You teach theory and composition? RHL: I’ve taught everything, actually, in my teaching career, the whole sequence of historical courses, and all theory courses practically from sixteenth century counterpoint up to the twentieth century. I teach private composition and orchestration, and my specialties these days are composition, orchestration and theory. Those are my principle areas. BD: Is musical composition something that really can be taught? RHL: There are two viewpoints here. Some people say it cannot be, and others, such as I, say one can teach up to a fairly large degree. It is apparent that if a person is totally untalented, then he’s going to have a very limited scope as far as what you can do with him. But there are methods and concepts. There are some basic techniques that almost any reasonably creative musical person could take, and once you give those to the student, then their own talent, their own personality, their own moods and emotions have to take hold. That drives them in the direction of an individual style, and with that they may go or they may not. But I do believe you can train the ear, you can train the mind, you can train the eye. There are various things you can do to get a person on the road. From there on, it’s a question of really how much ability they have, and whether can they sustain the kind of momentum you’re trying to give them. BD: “To get a person on the road.” Is there only one road they can get on? RHL: When I say ‘on the road’, that means writing music, whether it be for one instrument or ten. They get something on the page that is decent and musical and is of performance quality. That’s what I mean by getting on a road. Giving them the feeling that they can actually do it, that they can get started and shape and composition and carry it from beginning to end. BD: What are some of the characteristics that make it, as you say, decent? RHL: There should be some pronounced musicality. There needs to be ideas; there needs to be things there that one hears as having some musical value. We don’t want to deal exclusively with clichés and imitations of previous composers, nor do we want to have much music that you could write after studying the first ten chapters of many theory books. [Both laugh] You want something with a good instinctive personality, and with some sense of invention and imagination. I speak now of a very high level. That is what I consider a good student to have. Lots of students don’t have that, but they may catch it later. People develop at different speeds and different times. A student can be rather pedestrian for the first couple of years, and in the third year things will begin to spark. If he finds himself and awakens to many of the possibilities, things may shape up very well. In other cases, this may never happen. There is no formula. There are no sure-fire tricks or methods. It’s a question of adapting yourself to the student, and seeing what you can do from your resources. If there’s a point of contact, you can see what happens with it. BD: Are there some students that you’re very proud of? RHL: I have some good ones out there in the field. More recently I’ve sent them from Baltimore on to several of the better graduate schools on the East Coast where they’ve done extremely well. To that degree, I am very pleased with them, yes. BD: Are you optimistic about the future of the music as you see it coming from the pens of the young composers? RHL: I’m not so sure. Too many of the young composers are too bent on early and quick success. In many instances they are not allowing themselves to mature musically and intellectually to the point where the music might have some lasting value. Many of the younger composers want almost immediate acceptance, and that doesn’t necessarily allow for growth and maturity. A composer should work quite some time to get a clean fine technique, which will enable him or her to do almost anything they want to do. This should be accompanied by an intellectual growth and a great knowledge of music literature, as well as a musical development gained by playing an instrument, or doing something has to do with participation of the musical experience. There are some very talented young — and middle-aged — composers around. Sometimes people have a fixation on the young these days. There’s lots of people in their middle-age range who may have gotten passed over because of the American’s craze on youth. I have some reservations about some of the young because I see that there are more opportunities than ever for a younger composer, but I’m not sure that many of these opportunities are being used the right way. BD: What are the right ways to use these opportunities? RHL: Many of these people who may be getting these opportunities don’t really merit them in terms of their own creative development. If you’re a violin teacher, just don’t want to put the youngest violinist you have on stage to show him off. He’s got to play in tune, he’s got to play the correct rhythms, and he must play in the correct style and manner. The bowing arm has to be great, and everything has to be right if you’re going to risk a fine violinist on stage. But in many instances, the development of the composer may not be commensurate to that of the singer or violinist. Other musicians will show their distinct flaws to everyone involved, whereas a composer might be very mature and yet have technical flaws, but people, in many instances, would not know the difference. It’s a question of a composition sometimes going over, whereas performances will not go over if they’re inferior. We don’t need to assume that everyone who is composing music these days is writing something of a superior character. In fact, that would be a very, very false belief. There’s lots of inferior music being written these days, and in many instances the people don’t know the difference. BD: Who is it that decides which music is superior? Is it the critic? The other performers? Is it history? RHL: It’s a combination of many things. It’s time; it’s also the performers; to some degree it may be critics, and the public can also recognize these things. But in many cases you have some people who are not extremely qualified, who are judging competitions for young composers, and setting up commissions and so on. They’re doing it many times simply as an enhancement of the youth and, it has to be said, helping the young along without really waiting for the young to flower and mature to the point where they deserve these breaks. Now this is a contrarian view. Not everyone would say this, but I do think that we’ve reached the time in the development of American music where people really can be speaking out and trying to state things as they really are, and I believe I am doing this. Other people may say that I’m conservative and have a very biased opinion. I don’t think that’s true. I think that I have a very reasonable view, but I really don’t think that a composer can be very mature, in terms of his intellectual and musical development, until he gets up to the end of his twenties. In some cases there have been people who have been pushed in their late teens or early twenties, and in some cases they are mature and can carry the load, yes. But in some instances this falls short of the mark. BD: Many of the orchestras and opera companies around the country have a composer-in-residence. Is this a good idea? RHL: It’s a good idea as long as it doesn’t further develop the political networks which exist in American music. Some of the composers-in-residence and their orchestras have not fulfilled their mission. Foremost, they are supposed to influence the conductor as to what music should be played, and they’re supposed to find good works which they pass on to the conductor, hopefully with the warm recommendations and persuasive power to get the work programmed. In some instances, of course, this has happened. On the other hand, I think there are instances in which the conductor has adversely influenced the composer. Therefore, the whole meaning of this has not really happened, and the function of this has not really materialized. There have been some very good things happening here, but I notice many times these composers-in-residence seem to have their own buddies and cronies, and I see a succession of programs in which you can see a clear connection between one composer-in-residence and another, whereby they play each other’s music all the time. This was not the intent of the program as it originally began, and to that degree the political element’s too heavy, and then the benefit that was supposed to accrue to the broad segment of composers in this country has not really developed as it should. BD: What about ‘meet the composer’ programs? RHL: Those are very good. The presence of a composer in a situation is always a winning gesture. The mere presence of a composer who can meet the people and meet the audience, or talk to the audience and say something about the music, as well as shape the rehearsal or at least be present at the rehearsal is all to the good. This has definitely helped the recognition of the composer as a vital force in the art, but for that gain there has to be a receptivity on the part of the people. If you have a lot of people there who are not really interested in the contemporary music scene at all, I’m not sure that a composer is going to have that much effect. BD: A number of your pieces have been recorded. Are you pleased with the recordings that have been made of your music? RHL: Yes, in general I am very pleased. I’ve done quite a number of recordings abroad with London orchestras, and my most recent collection of these will be a CD which is being released by CRI before the end of the month. 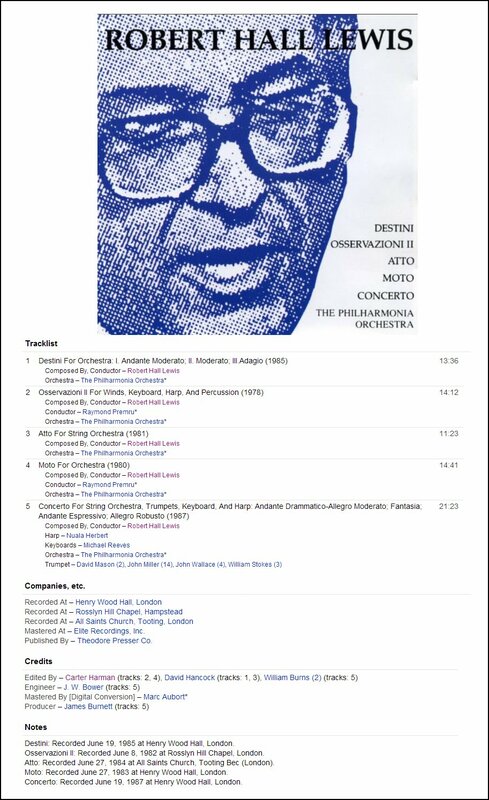 Those are five orchestral works that I conducted and recorded with the Philharmonia Orchestra of London, one of the great orchestras of the world, and I’m very pleased with the total result of that. BD: Do you conduct differently in the recording studio than you do in the concert hall? RHL: In the recording studio you do not conduct as you will in the concert hall because you have to divide the composition into various segments. You take certain segments at a time, and rehearse and record them at the same time. In the concert hall, obviously, it’s a straight run through without any stopping. You cannot say anything, you cannot correct. You simply accept what comes, and hope for the best. So there’s a different in the technique applied to recording, rehearsing, and concert production. BD: But do you not try to get as close to a perfect performance in both places? RHL: Well, of course! There’s no question about that. The advantage of recording is that you have a second chance, and that some of this can be edited. For a once-through in a concert hall, you have to accept simply what comes, but my approach to conducting is the same under any circumstances. You have the desire of getting the best possible product, and you go about it using the technique, the gestures, the facial expressions, and whatever has to go into this to get the best possible result. So fundamentally there is a technical difference, but the general direction is the same regardless of where you are conducting. BD: Is there ever a case when you’ve made a recording, and one particular take will have a little more energy and a little more spontaneity, and maybe one missed C# that would spoil it? RHL: I’ve been very lucky on that score. I have generally ended up with third and fourth takes, and those have turned out to be consistently good from all aspects. So I don’t have any such problems as those. That can happen with the lesser orchestra. With the Philharmonia Orchestra of London, you’re conducting such wonderful people that are just marvelous. They’re very intelligent and highly professional musicians, and highly reliable. So those things can happen, but with editing techniques as they are these days, sometimes you can work around that, too. BD: Just drop in the errant C# and leave everything else the same? RHL: If you’re using the technique of digital editing, that allows you a great deal of freedom when it comes to small areas of the music which should be inserted or spliced. 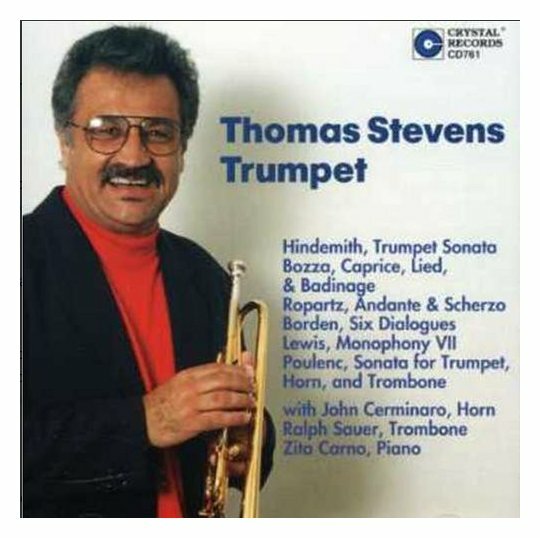 BD: Might a spliced-up performance ever set an impossible standard that you can’t duplicate in the concert hall, but comes to be expected because people hear their gramophone records day in and day out? RHL: Not really. If a work is well-rehearsed you should end up getting as good a performance in the concert hall that you would on the disc. Of course there’s always the human factor. If the horn player’s having a bad night, or some other players may not be in good form, there can be that very little feature. But fundamentally I don’t think one should expect too much of a difference between the recordings and the actual performance. BD: Let’s talk about some of your specific pieces. Which of them are on this new recording? 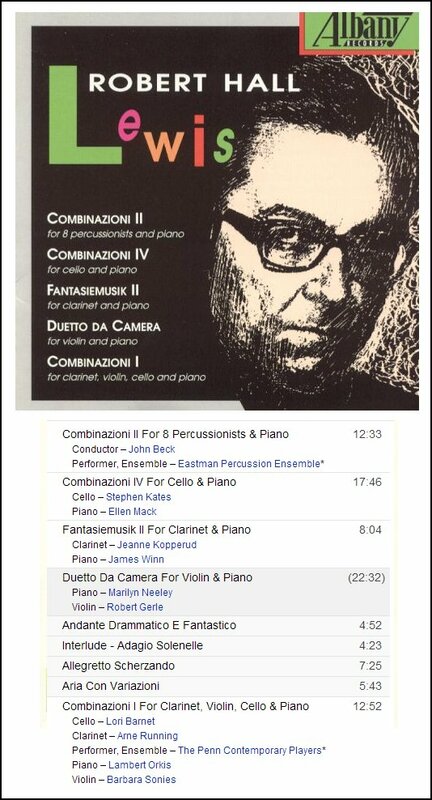 RHL: The CD recording I mentioned has five works. The first is a work called Destini, which I composed in 1985 purely for this recording. 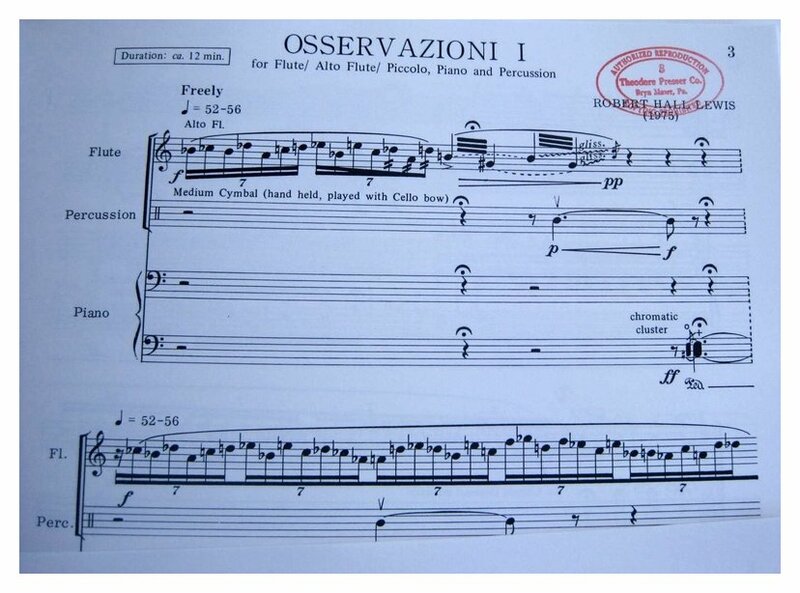 The second work is Osservazioni, and that is a work for winds, keyboard, harp and percussion. It was a National Endowment for the Arts commission, and it’s a rather colorful and unusual piece for winds. The third work is Atto, which means ‘Act’ in Italian, and that’s a work for string orchestra which includes a well-known melody by Claudio Monteverdi. The fourth work is called Moto (Motion), which is for large orchestra including percussion, keyboard, and accordion. 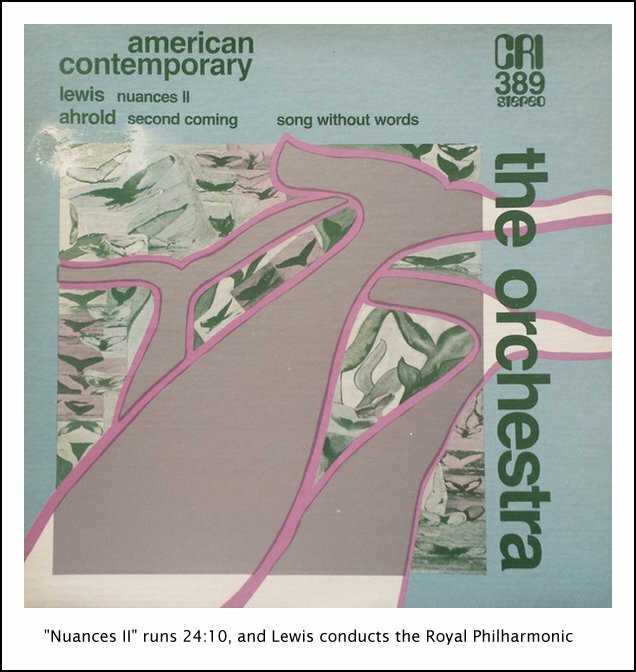 The last work is a Concerto for Four trumpets, String Orchestra, Keyboard and Harp, which was also a National Endowment for the Arts grant work. It’s about seventy-five minutes of music, and each one has a different sound in terms of instrumentation. I feel that it’s a nice combination of works, showing me in different directions, but still fundamentally the same creative personality. BD: Now you mention ‘keyboard’ several times. Are these regular keyboards or electronic keyboards? RHL: No, when I say ‘keyboard’, I’m speaking of one player who will play a celeste and piano. BD: Do you do anything with electronics? RHL: No, I never have. I haven’t really felt any special compulsion in that direction. I have more ideas than I can ever use for instruments and voices at this time, and while I like the sound of some computer music, I just don’t find the time to lead myself in that direction. The other commitments I have keep me keep me pretty well occupied, and I’m fairly happy with the direction I found in style now, and I’m keeping on with that. BD: Now you say you have more ideas than you could ever possibly use. Is there a little storehouse in your brain so that when you have a commission, you go up there and call upon this or that idea that’s already there? RHL: [Smiles] It’s not so much that there is a store of musical ideas. It’s a question of what works I would like to write. I would like to write a number of trios for instruments in the orchestra. When you consider the number of trio combinations that’s in the orchestra, you’ve got at least a good five years’ work there if you want to go at it. And I would like to add a number of concertos for the principal concerto instruments, such as the cello, piano, violin, etc. RHL: [Laughs] Well, that would be very nice, I suppose, if someone’s willing to pay for it. It would not be my first spark of inspiration, let’s say. BD: But if someone came to you and offered X number of dollars to write a concerto for contrabassoon, you would get at it? RHL: Yes, I would! Actually I enjoy the contrabassoon and often feature it to some degree in my music, but it’s not something that I would want to base a piece upon totally at this moment... although I could probably get into it. I’ve heard a couple of good ones, and it has potential. Played by a fine player, it’s a very rich instrument. The danger with the contrabassoon is that very easily you can obscure it by writing too heavily for the rest of the orchestra. So you have to consider fundamentally a kind of light score so that the thing comes through at all times. BD: Light and high-scored to counter-balance the range? RHL: Yes, but it also means don’t use all the instruments all of the time or you’re not going to get the contrabassoon. It’s simply a question of gauging the weight of the various forces. BD: Do you ever write for voice? RHL: Yes. I written for chorus, and a couple of things for solo voice, although I’m not driven in that direction too much. I like the voice, but somehow I’m not totally satisfied with simply representing poetry that can be totally comprehended and clearly perceived by the audience. If I write something for the voice, I like to do something to use the voice as quasi-instrument, or to give it a certain feature which would not be purely in the vocal tradition — maybe a bit of theater, or have a certain quality of enunciation, or a mixture of languages — things of this sort which the purest would probably poo-poo. In general, I’m led in a more unconventional direction, so since lots of people and lots of performers don’t especially care for that, I’ve not forced myself to do much of it. [Pauses a moment] ‘Forced’ is not the right word. I have not let myself be led into that medium simply because instrumental music has enticed me more most of the time. BD: You haven’t been conned into writing for the voice? RHL: ‘Conned’ is also another good word, but I don’t allow myself to be conned. One knows very easily what the consequences of that are, and you generally steer clear of it. RHL: It can be great fun at times. It can also be something less than fun. Sometimes it can be very arduous hard work. Again it’s a question of your degree of inspiration, and if you have the time to really allow yourself to become totally absorbed. If you’re feeling well, in top shape physically and psychologically, then it can be fun. But there are times when it is less than that. Sometimes it can be very difficult. I’ve gotten into situations in orchestral works where I may be moving along with only one or two bars per hour. That’s something that you’ve set up for yourself. 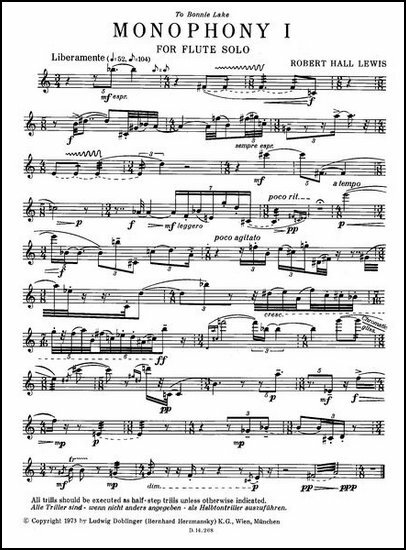 You’ve set up requirements, you’ve set up difficult rhythmic and contrapuntal situation, and sometimes you regret that you’ve thought on such a high level. At that point you find yourself working harder, and at that point it is less fun. It’s fun when it goes beautifully, and you’re feeling well, and you know the work is going to be good. When you are in doubt, when you’re working harder than you think you should and it’s not paying off, then of course it’s something less than total joy. BD: [With a gentle nudge] You mean you always look for a pay-off? RHL: No, I am not looking for a pay-off, but at some point there should be a pay-off of one kind or another for each work you produce. Obviously something has to happen with it, but whether it’s a positive pay-off or a negative is another matter. BD: But there has to be something for you, at least a performance. RHL: Oh, yes. Certainly there must be a performance, and hopefully there will be some gratification that you receive from the performers who will like it and get pleasure from it. For me that is one of the finest areas of satisfaction — simply realizing that the performers are really enjoying your work. This can carry to an audience, and the whole adventure is therefore quite successful. It will be even more successful if there is a music critic around who also ties into this, but many times you don’t get the complete sequence. There’s a breakdown somewhere. You think you’re getting a fine performance of a good work, and everybody’s playing well, but the performers didn’t like it, or the music critic maybe tired or irritated that night, so he doesn’t respond very well. BD: Which of your pieces has perhaps been played the most and has gotten the most performances in the most areas? RHL: Oh, that’s very hard to say. I’m not sure I can single out any one work for this. I don’t get dozens of performances. If I can get fifteen or twenty performances a year, that is quite fortunate. BD: Is there some piece that a lot of groups have taken up? RHL: I have no immediate hits or anything of this nature. 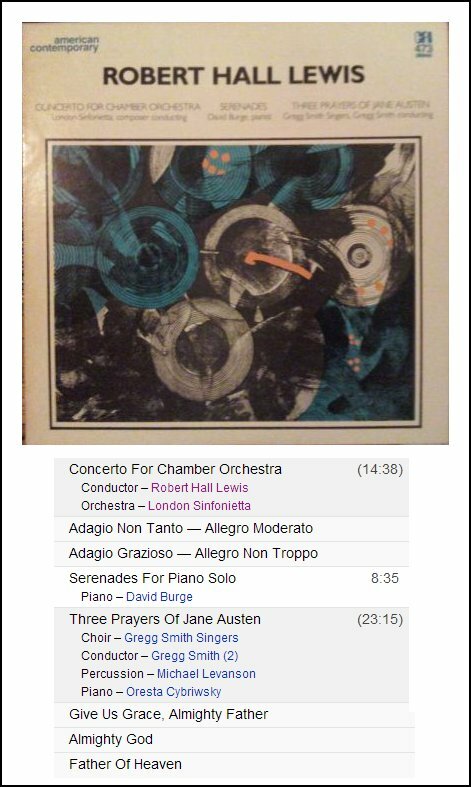 I have a number of chamber works that get played at various times, but I’m not on anybody’s hit parade. BD: Do you want to be on a hit parade? RHL: I’m not sure that I think seriously about it. I don’t even think about it at all to speak of. Some people seem to have a kind of hit parade going, but I would not place myself in that category. I have a number of works published in Europe, and they get played over there. Sometimes I don’t even know about it, and I get no ASCAP credits for it at all. BD: All of a sudden a program shows up in your mail box? RHL: Yes, or somebody sees me and says, “Hey, we did a piece of yours several years ago in England.” Well, that’s nice, but I didn’t know anything about it. These things do happen. A tuba player in Amsterdam wrote to my publisher asking questions about a work that’s published in Vienna by Doblinger Verlag. The publisher couldn’t get him any answer. I couldn’t understand why he couldn’t, but I had to be in Vienna to give the answer so that the publisher could write the answer back to the fellow in Amsterdam, who eventually played it. But things like this happen unknown to me at all. Hits? Some of them are selling rather well as though they might be hits, but again, I have no contact with those European sources except in receiving a royalty statement every year. BD: [Putting a positive spin on all this] You are reasonably successful in that you’ve had quite a number of recordings made of your work. RHL: Yes, I’ve been very fortunate in that, and I hope to continue. I don’t make the orchestral circuit as well as many people do because the music I have is difficult to rehearse, and I’m not a household name. I have no real force going for me in the orchestral domain to compensate for this, so I go around with a tin cup and get enough money together to do my own recordings and conduct them myself, which of course is saving a great deal of money. Recording in England is not terribly expensive when compared to recording in this country, and I’ve saved myself thousands of dollars by doing my own conducting. So I carry on doing this. I usually find the recordings go very well. BD: Does it please you to know that these recordings then are on library shelves and in private collections, and are listened to on occasion? RHL: Yes, that’s always very gratifying, and it’s gratifying to be browsing around in European music shops, and see someone else who finds a recording of you there in the stacks, which is a sign. At least that somebody is doing a good job in distribution. RHL: Don’t rush. Take plenty of time to mature. Learn a lot about the field of music because you’re going to have to probably be doing something other than composing to earn your living. So educate yourself well, learn the literature, which is a very time-consuming pursuit. BD: When you say learn the literature, do you mean Bach and Beethoven, or other contemporary items? RHL: All other literature. The total literature of music, going back to the mediaeval period. But, of course, much of this is not accomplished until one goes to graduate school. We’re talking now about graduate requirements, and these are broadening experiences. The whole world of music history is therefore absorbed, and you get increased insight by knowing these developments as they have come to us from the ninth century on. Young composers should concentrate on getting a good clean craft and technique, and develop an artistic integrity, and a good critical sense. All of these things are not something that can be gained in just a few years. This is the project of quite a number of years of development and listening and observing and performing. The composer after all should be a supreme musician. He should come into the art by way of performing an instrument, perhaps singing in a chorus or playing in an orchestra. He should have had fine training in that instrument so as to develop his musical sensibilities. After all, one needs to have a good sense of rhythm and a highly developed aural sense. The ear is sensitized to sound quite well, and all of this comes through performance and stimulation of the mind by listening and studying other music. But again it’s something that takes a great deal of time. So what I would say to young composers is simply if you think you have it, stick with it. Do not be discouraged regardless of what happens, but don’t expect immediate results until you really deserve them, and that means quite a few years of preparation. BD: What advice do you have for audiences? RHL: Oh, well, now we have a different category entirely. The best thing that can happen with audiences on hearing at least a new piece of music is to keep an open mind. I remember the late composer, Roberto Gerhard, who was one of the best of the twentieth century, although he didn’t get much recognition. He said the public should have a willing ear. In other words, let them listen with an open mind, and try to embrace what that composer was doing even though they may not totally perceive that on the first hearing. The best thing is to not prejudge and be too prejudiced and too biased. Lots of people go to concert halls biased initially against contemporary music. They have a prejudice that new music always has got to be bad. It’ll be dissonant, and all of that. You sometimes hear talking like that when they go into a concert. Maybe not as much nowadays as you might have ten years ago. But even if it’s not spoken it is still thought. Therefore the audiences should allow themselves to realize that the twentieth century presents different theses of sound than they have heard in music of the previous centuries. Much of this is very valid, and it is a part of the culture of our time, and they should absorb naturally as the audiences of the eighteenth and nineteenth centuries by and large absorbed the music. It’s simply a manifestation of the times, and so much the better. BD: Now we’re coming towards the end of the twentieth century, and heading into the twenty-first century. Are there some trends that are going to carry through, or are we going have a big line of demarcation? RHL: I’m sure that the high tech in music will continue. I’m sure the computer is here with us to stay, and electronics of various kinds will surely continue and probably develop even more. It’ll be a greater proliferation perhaps. One hopes the orchestra will survive. The cost of the orchestra these days means it’s going to have to get a little bit more... well, substantially more help from the government before some of these orchestras will survive. The musicians who play deserve good salaries and fringe benefits, and they require more and more money all the time. The cost to producing concerts — rendering of music, commissioning, the cost of soloists — are driving budgets up to a very high domain. I hope the orchestra will survive, and maybe it will survive more in the sense of amateur orchestras, with lots of orchestras developing around the country. I’m surprised sometimes where they are. Many of them are amateurish, but at least they’re able to pull up the repertory to some degree. There are plenty of talented students in this country, and unfortunately our society cannot really absorb the talent that we have. I’m sure there’ll be a pretty much of a continuity from what we have into the twenty-first century. We’ll have the aspiring singers and violinists and trumpeters, and the talent will be ever with us. It’s a question of how it’ll be encouraged and supported. At the present time, if one can gauge the future from the present, the number of competitions for musicians of all kinds are such as to keep people striving and walking forward. For composers probably it’ll be the same. There may be some reduction in the masses of people who are studying music. There may be an amateurish stream, which might be very good because the participants who are not professionals may switch themselves into the appreciation of the professionals. Those who play poorly may empathize greatly with the finest players. That is the source of a great deal of potential appreciation, and perhaps stimulation of the public in the future. But as far as musical trends are concerned, you’re probably going to find a continuation of pretty much what we have now. There may be more return to neo-tonality, or there may be a return to non-tonal music. There are certain types of music which may play themselves out in the next nine or ten years, simply because the interest may not sustain the attention of the audience very much longer. It’s hard to say, though. A lot this may depend on the economic welfare of the country, how it’s going, and what the careers simply seem to offer in terms of long-term potential. BD: That is all good advice. RHL: Well, I hope so! RHL: That’s awfully generous of you. That’s a fine system you have there. It’s one of the rare ones I’ve heard of in this country. This CD (above) is a compilation of most of the items from two LPs. William O. Smith, Leslie Basset, and Bertram Turetzky. This conversation was recorded in Chicago on March 3, 1990. Portions were broadcast on WNIB the following year, and again in 1996. This transcription was made in 2017, and posted on this website at that time. My thanks to British soprano Una Barry for her help in preparing this website presentation.